Cities are the centers of trade and ideas that define modern life. What makes some places more attractive than others? Why do some places succeed and some fail? Common features that enable places to thrive are their ability to attract people and to enable them to collaborate, which requires smart and efficient urban development and management. But the challenges can be immense. Today, more than 54% of the world’s population live in urban areas, and this urban population is likely to grow to 6 billion by 2045. According to U.N. estimates, 99% of all population growth between 2010 and 2100 will take place in developing countries, led by 83% in Africa and followed by 13% in Asia, particularly the continent’s less developed parts. The anticipated explosive population growth increases the demand for energy, mobility, water, and other urban services, and will put existing urban infrastructures under enormous pressure. The two main challenges for cities in this context are 1) the difficulty to provide primary and secondary infrastructures at the same pace as the population grows, and 2) the necessity to increase infrastructure efficiency. Coupled with the risk of marginalization and expanding urban slums (1/3 of the megalopolises in the emerging world are formed by slums), the question how to accommodate population growth has become critical for city planners, especially in the developing world. Roads not well planned, informal labor markets and land ownership patterns constitute an obstacle for the proper functioning and economic growth of any city. “Informal economy and informal development (shadow economy) is what we call the Peter Pan syndrome”, says Pedro B. Ortiz, senior urban planner at the World Bank. It is extremely tricky to leverage the existing limited local financing and to generate revenue streams from the functioning urban infrastructure when you are facing the challenge of prioritizing the use of available financial resources on maintenance and proper operation of different infrastructure elements. Especially in emerging cities with limited cooperation among local governments, urban developers fail to resolve this problem. According to a McKinsey study, policy makers have a different set of challenges: In the developed world, the goal is to maintain a healthy rate of growth through higher productivity, new business investments, and enhanced links with emerging regions. In the developing world, the task is to manage growth in a way which avoids ‘diseconomies of scale’ and creates the basis for sustainable economic performance. This problem becomes especially complex for metropolises which “have the GDP of nations and have to be run as nations, not cities,” and where governments are in charge of inter-connectivity and the system management of all city services and infrastructures under one jurisdiction. A common mischief for many city developers today is the lack of political will and commitment from their local government, which can be partly explained by the so-called “Not In My Term of Office” syndrome: “That is politicians and their civil servants prefer to use the budget for something short term rather than something strategic that will take a budgetary commitment and will take longer”, explains Pedro B. Ortiz. As such, the urban governance challenge is essentially one of leadership. Political leaders have the power and instruments to encourage the necessary collaboration between the market, civil society and the state. And this collaboration is key to align the vision and strategy of the city’s stakeholders. Only when collaboration and dialog are happening, then the city becomes a distinctive brand, a competitive and attractive “player” in the global market place. Good governance then means to take an integrated and long-term approach to the city development, based on a common vision shared by all city stakeholders. 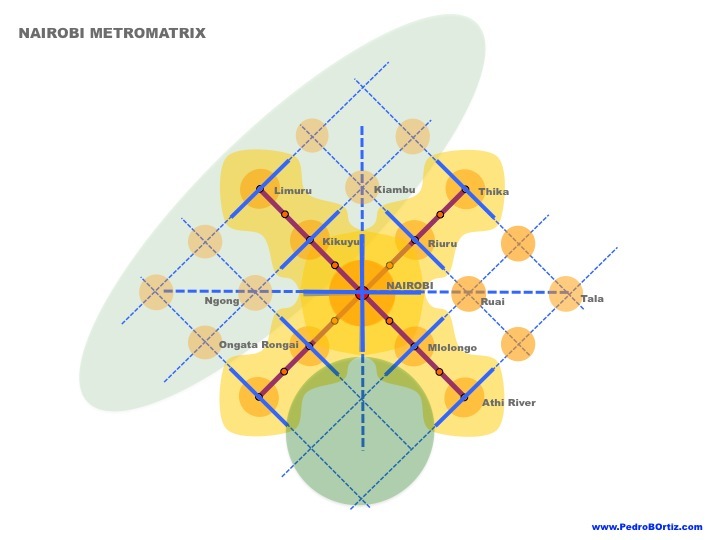 Metro Matrix is one of the advanced solutions for structuring expanding metropolises efficiently, that is, to allocate space for growing and new populations in areas away from the city center, where population pressure is felt the most. This means to move away from the traditional city model with one central business district and surrounding suburbs, towards cities with several centers, in order to spread pressure across the city landscape. The Metro Matrix method proposes city planning where each neighborhood center has its own character and design of public space, reflecting the wishes of local residents. This generates a sense of belonging and higher engagement of the residents in their city life. In times of rapid population growth, the Metro Matrix method stands for a necessary change of mindset in regards to city governance that is focused on social consensus and shared decision making, involving all city stakeholders, and following a long-term vision. There are dozens of examples of successful implementation of the Metro Matrix approach in the developed and developing world over the last 20 years, including Madrid, London, Bogota and Medellin. The method is explained in detail and illustrated with examples in the book “The Art of Shaping the Metropolis”, published in 2014. The rapidly developing metro area of Nairobi, Kenya (NaMSIP project), is a current example of the Metro Matrix method in action. 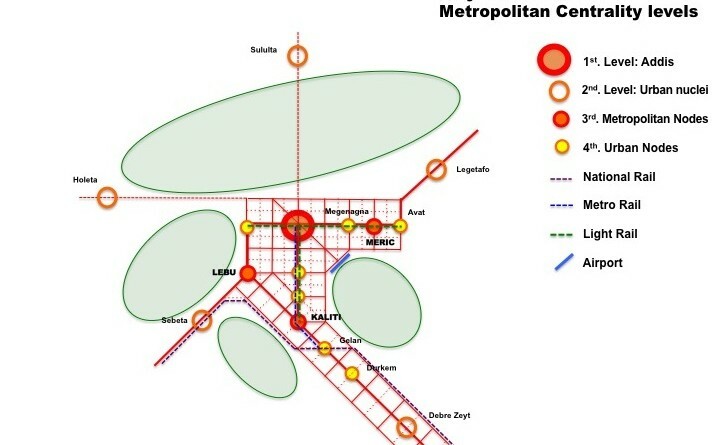 In March 2011, Pedro B. Ortiz presented the Metro-Matrix approach to Nairobi officials, and explained how the TOD (Urban Centers) could be implemented as part of the new commuter system as a way to reduce pressure from the city’s CBD. The World Bank decided to finance the project with 400 million USD. “Metro Matrix development could be a success in places like Accra, Kampala, Maputo, Abuja, Monrovia, to mention only some. Recently the World Bank has launched the public tender for a similar development of the project in Addis Ababa”. Nairobi could become a template for fast developing African cities and an example for urban development inspired by a long-term vision and stakeholder collaboration. I would like to thank Mr Pedro B. Orbiz for his valuable contribution and insight to this article. 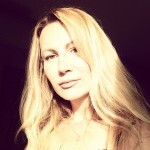 For more details on the Metro Matrix method and examples of application, visit pedrobortiz.com.